Garibaldi fishing charters are all about variety. 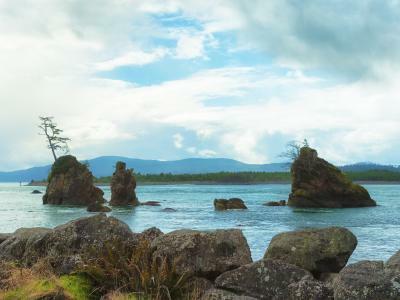 The secret lies in this port town’s strategic location on the edge of Oregon’s northern coast. Garibaldi is quite literally the gateway between the protected waters of Tillamook Bay and the Pacific Ocean, and the result is one fantastic fishery with magnificent opportunities. Anglers can experience everything the Oregon Coast has to offer here, from fly fishing in the rivers and clamming on the beach to deep sea fishing. These waters offer excellent sport and superb table fare, including iconic catches like Chinook Salmon, Albacore Tuna, and Dungeness Crab. It’s easy to hook into multiple game fish while you’re fishing in Garibaldi, and even easier to get hooked on the great fishing. 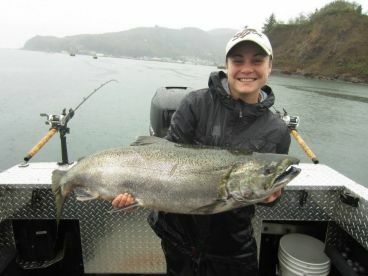 Tillamook Bay offers some of the most diverse fishing opportunities on the Oregon coast. Fed by no fewer than 5 local rivers, these waters are rife with game fish, from Salmon and Lingcod to Clams. 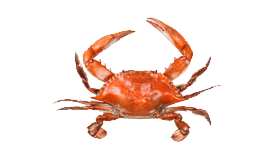 You can expect excellent winter crabbing here, provided the season is relatively dry. On the other hand, a rainy season draws many Sturgeon into the bay, where anglers have a field day fishing for them without losing their bait to pesky Crabs. The tidal flats offer some of the best clamming in the state, while local jetties bring Lingcod, Greenling, Sea Bass, and even Crabs within reach for anglers who prefer to keep their feet on dry land. More than anything, Tillamook Bay is known for its fall Salmon season. Massive Chinook appear in September and stick around through November, gradually moving inland. Anglers here catch several specimens in the 50-60 lb range each year. The bay also sees a modest spring Chinook run between April and June. A little over 10 miles north of Garibaldi lies Nehalem Bay. Though these fishing grounds are often overshadowed by Tillamook Bay, you can still expect good fishing here. Anglers fishing in Nehalem Bay have the unique advantage of an early fall Chinook run, beginning as early as July in some years. 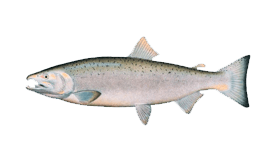 You can also catch wild and hatchery Coho Salmon in these waters, just pay special attention to regulations so you know which fish you can keep. Coho tend to peak in Nehalem Bay around September. This bay also offers good crabbing, clamming, and Sturgeon fishing on occasion. For a chance to dabble in some of Oregon’s deep sea fishing, look for a charter that will take you offshore. 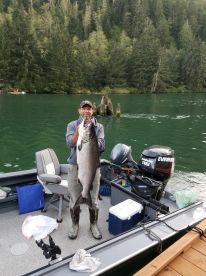 Regulations and fishing conditions vary from year to year, but you can generally expect to find Ocean Salmon off the coast of Garibaldi in July and August. Around the same time of year, Albacore Tuna pass by on their migration north, anywhere from 40-100 miles offshore. Other popular catches on Garibaldi deep sea fishing charters include Lingcod, Halibut (typically open from May-September), Cabezon (opens in July), and Dungeness Crab. The Wilson River flows directly into Tillamook Bay and offers excellent year-round fishing for Salmon and Steelhead. These waters are no secret to anglers in Oregon, and the river can get very crowded on occasion. The fall Chinook and winter Steelhead runs are the highlight of this river’s fishing scene. Salmon fishing tends to be strongest in the lower river, with a peak season in November. Winter Steelhead fishing is best up by the South Fork, with late winter and early spring providing some of the best action of the season. You’ll also find a strong Cutthroat Trout population here, including sea-runs in late summer. While it may be smaller than the Wilson and other feeder rivers around the bay, Tillamook River offers decent fall Chinook and winter Steelhead fishing. Cutthroat Trout, Coho Salmon, and Spring Chinook also grace these waters, accompanied by Sturgeon in the tidewater. This river is harder to access than other rivers in the area, and it’s important to read local regulations carefully before casting lines here. A Garibaldi fishing experience doesn’t end there. 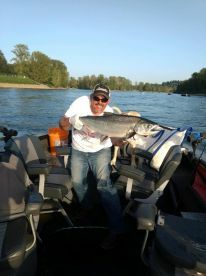 The Nehalem and Nestucca Rivers to the north offer more Chinook and Steelhead fishing, including spring and summer runs. A series of lakes along the coast offer good fishing for Rainbow Trout, Largemouth Bass, Sunfish, and Catfish. Cape Meares Lake on the western edge of Tillamook Bay is one of the closest lakes where you can catch these species. 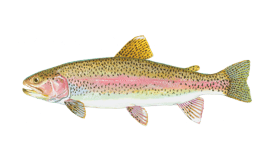 The lake is stocked with Rainbows in spring and sometimes again in September, with fewer (but larger) Trout. Deep sea fishing off the coast of Garibaldi involves trolling and bottom fishing. Trolling is the main technique used to catch Salmon and Tuna, while bottom fishing produces Lingcod, Halibut, Rockfish, and more. Many local charters offer combo trips so that you can catch Dungeness Crab on the same outing. 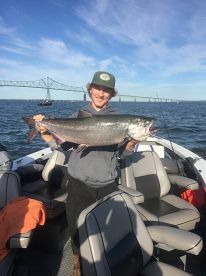 Anglers also rely on trolling and bottom fishing in Tillamook and Nehalem Bays, using slight variations depending on where exactly they fish. 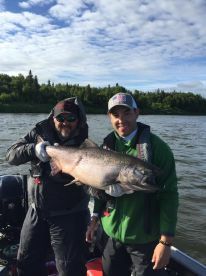 It’s common to deep troll cut-plug Herring near the bay entrances while fishing for Salmon, but many anglers opt for spinners while trolling in the middle of the bays. Fishing in local rivers takes on a variety of forms, depending on the target species. You’re likely to troll for Salmon, mainly back trolling and bouncing roe along the bottom. When it comes to Steelhead, nothing gets your blood pumping like fly fishing. Those who prefer to use spinning gear can also have great fun targeting this fish on light tackle. Drifting smelly baits like Crawfish, Clams, Shad, and Salmon eggs near the bottom will help you catch Sturgeon. Whether you’re one for light tackle or fly fishing, you can expect to catch a variety of species while fishing from local jetties and shorelines. 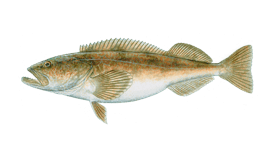 Lingcod, Surfperch, Greenling, and other fish take well to Herring, Clam necks, and Sand Shrimp. Garibaldi fishing charters do not provide fishing licenses. Anglers age 12 and above must bring their own license, available for purchase on the ODFW website and many licensed retailers. Single day licenses costs $21 (price subject to change). Anglers age 12-17 can buy a youth license for $10 (price subject to change). Local fishing regulations change annually and some species are not always open to harvest. Regulations can change during the season and fishing seasons can close early in some years to protect local fish populations. Always check for updates ahead of time. It’s important to note that regulations may be different depending on which bay, river, or area of the coast you plan to fish. Bear in mind that fishing regulations for Ocean Salmon, Lingcod, and Crab are not always the same as regulations in local bays. Fishing with a local guide is the easiest way to follow local regulations. Early in the year, anglers in Garibaldi focus on bottom fishing in the bays. Lingcod and Dungeness Crab are plentiful in these protected waters. 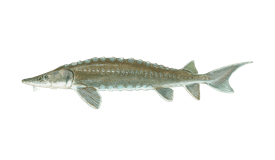 In rainy years, you’ll have better luck fishing for Sturgeon. Try your luck in the bays and bring home delicious Crab and Lingcod. 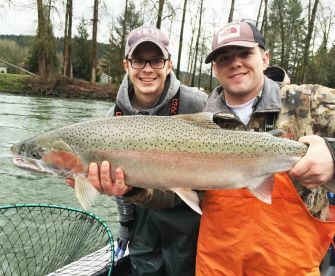 If you’re looking for an adrenaline rush, head to one of the local rivers to make the most of the winter Steelhead run. Crabbing tends to slow down in March, but excellent clamming kicks in just in time to keep you busy. Light tackle and fly fishermen can enjoy some of the best winter Steelhead fishing this month. 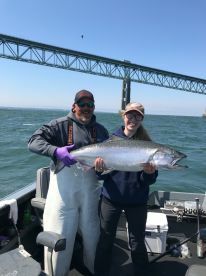 Depending on regulations, you might have a shot at some of the best spring Chinook fishing Oregon has to offer while casting lines in Tillamook Bay. Try trolling spinners in the upper bay. Halibut season usually opens in May. If the Salmon season didn’t open in April, you can expect it to open this month, just in time for the peak of the spring Chinook run. Clamming is excellent. With average temperatures as high as 65°F, June is a great time to see what Garibaldi deep sea fishing is all about. Head offshore for Lingcod and Halibut, or scour the beaches for Clams. In July you can enjoy the greatest variety Garibaldi has to offer. 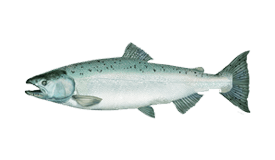 Albacore Tuna are appearing offshore, while early fall Chinook make their entrance in Nehalem Bay. Bottom fishing continues to deliver. Garibaldi sees very little rain in August, with average temperatures soaring almost as high as 70°F. Be sure to get in on the Tuna run while you can. Keep your eyes peeled for the start of the fall Chinook season. Fall is all about big Chinook and Coho Salmon. This is one of the best times for deep sea fishing, while anglers are still reeling in Tuna offshore and bottom fishing is as good as ever. Halibut season often closes in October. Fall Salmon fishing continues to draw anglers from far and wide to Tillamook Bay. Clamming and crabbing are picking up momentum. Head to the Wilson River for some of the best fall Chinook fishing this river has to offer. The winter Steelhead run is kicking in, accompanied by strong Sturgeon fishing in the bay. Crabbing is at its height, while bottom fishing continues to produce Lingcod and Cabezon. If the weather is rough, comb the beaches for Clams or head to the rivers for winter Steelhead. "Review of Play N Hookey Charter"
Don't bring any of your own fishing gear. Dress for rain and cold - although it was 81 degrees on 10-17-18 when I went.